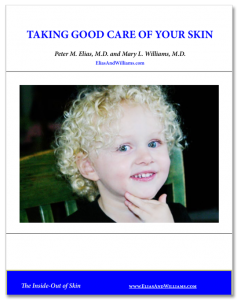 What is the Skin Barrier and Why Does it Matter? Let us go back many eons in time and imagine that first fish as it attempted to venture out onto land. Bear in mind that most creatures and most cells are about 80% water. How could our fish retain its body water, as it left its wet surroundings to live on dry land? How could it keep the water in its cells from evaporating away into the dessicating air? This new world was a hostile one that threatened to turn our fish explorer from a plum into a prune? This newcomer to land needed some type of ‘permeability barrier’; it needed some form of waterproofing. Biologists call the outer protective covering of plants and animals, their ‘integument’; we call ours ‘skin’. In every species, whether plant or animal, the most critical function of the integument (including our skin) is to protect against loss of body water. Our skin barrier’s number one task is to hold our body water inside. In mammals, including man, the barrier to loss of body water is provided by the outermost layer of skin, the ‘stratum corneum’. This tissue is made up of multiple stacks of flattened cells or ‘corneocytes’, each of which is encased in a thick coating of fat (or ‘lipid‘). The stratum corneum can be likened to a brick wall. The cells of the stratum corneum no longer possess nuclei or any other organelles like mitochondria; they are by all accounts ‘dead’. 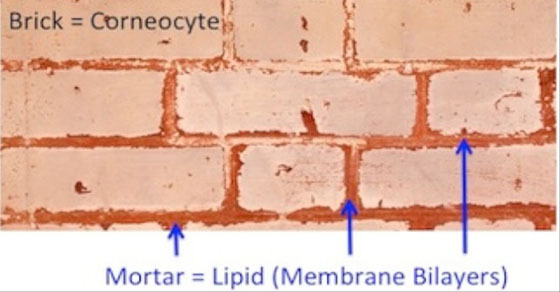 These ghost cells are the bricks in our brick wall model; and the fatty matrix that surrounds them is the mortar. This wall – the layers upon layers of dead cells with their surrounding oily, water-repellant coating – provides a formidable barrier to the outflow of water from our interiors. It also produces a protective shield against the entry of noxious materials, such as bacteria or allergens, from the surrounding environment. This in a nutshell is the skin’s barrier. This barrier accomplishes a whole set of critical defensive functions that extend beyond holding body water in and keeping microbes and foreign molecules out. For example, the stratum corneum also blocks the penetration of ultraviolet light, filtering much of it out before it even reaches deeper into the skin, where most of the pigment or ‘melanin granules’ reside. Melanin is in fact only the second line of defense against the penetration of ultraviolet rays. If you are interested in learning more about the skin barrier and how it works, see our related post, How The Skin Barrier Works, or sign up to receive our Primer on the Skin Barrier.